The Des Redburn Memorial for Modified Sedans will be held this Saturday night at the Cranes Combined Carrick Speedway with a quality field entered for the time honoured event. The competition this season has been highly competitive with four drivers in Saturday nights field having won a Feature event, with Trent Quillerat starting to find some strong form, having won four Feature races including two at the Carrick venue, and a last start win at Hobart. Quillerat is sure to get plenty of tough opposition from Brad Herbert, Craig Williams and Andy Russell to name a few, with practically the whole field capable of winning. 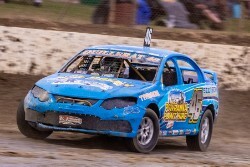 Junior Sedans and Street Stock are also on the program. Photo: Trent Quillerat will be hard to beat on Saturday night.